Impact Pro Wrestling is celebrating 15 years of the best professional wrestling in New Zealand with a return to it's home base for IPW XV. This huge 3 hour live event will feature wrestlers from throughout IPW's illustrious 15 year history. After winning The Best Of Five series, Liam Fury gets his championship opportunity against the New Zealand Heavyweight Champion Mr Burns. Liam and Burns have been best friends and bitter rivals, at IPW XV they go to war one more time, with the biggest prize in the country on the line. The New Zealand Women's Championship will be on the line when current Champion Candy Lee takes on Australian wrestling sensation and current Heart of SHIMMER champion Shazza McKenzie, the best in New Zealand takes on the best from Australia in this huge trans-tasman battle. IPW XV will also pays tribute to a man who paved the way for professional wrestling in New Zealand as 'The Machine' is the first person inducted into the IPW Hall Of Fame. 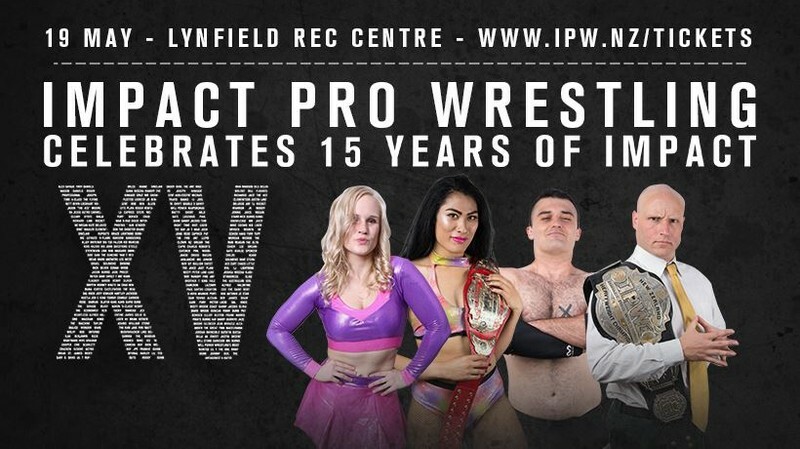 Come celebrate a decade and a half of Impact in style at the Lynfield Rec Centre, in a night that celebrate the history of IPW NZ and the future of New Zealand wrestling.